We created this application to greatly simplify the process of connecting to IronSocket’s global network of servers and services. EasyVPNConnect is free and available for all subscribers to use. Getting started with it is as easy as 1-2-3: download, install, and run. There is no third-party software to download and there is no need to import any additional server profiles. It’s an all-in-one, self-contained application for VPN, DNS proxy, and IP address whitelisting (authentication). EasyVPNConnect offers important features such as strong encryption, VPN drop protection, and DNS leak protection. With the continuously evolving threats to our online privacy and security, it has become critical to use VPN when connecting to public Wi-Fi. With our new application, you can protect yourself with just one click of a button, whether you are at home, out and about, or traveling abroad. Existing subscribers and new users can now save 40% on the already discounted annual subscription rate. 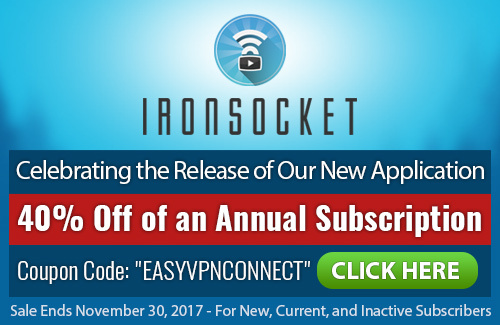 Existing subscribers need to be logged into their account and go to https://ironsocket.com/pricing, then pay like you normally would using the coupon “EASYVPNCONNECT” on Step 3 of the payment process. Once you have paid, please contact customer support and they will manually update your current subscription. If you have any questions don’t hesitate to write to us. Our privacy and security experts are here to help you stay safe, secure, and protected while online. This sale will end on November 30, 2017. Every Monday we bring you a review of the previous week’s hottest cyber-security and on-line privacy news articles. Here at IronSocket, we work to continually call attention to the risks and threats to our online privacy and security that we as individuals face in our connected lives. We are 100% committed to helping our customers stay safe and secure while on-line, both through our VPN and proxy services as well as through education. Here are the top articles we have rounded up from this week’s news stampede. Are you a Mac user? Do you have any Eltima software installed on your Mac? If you answer yes to these two questions, we have some unpleasant news to share with you. Hackers managed to get in to Eltima’s development systems and insert a remote control trojan called PROTON into their Elplayer and Folx apps. If you have downloaded and installed either of these apps recently, brace yourself. We’ve checked numerous outlets and the recommended solution to this rather nasty problem is to wipe your Mac clean (reformat the hard disk) and reinstall the OS from scratch. Not so loud, honey. The TV is listening. What’s next? The microwave recording our thoughts? Apple (iOS, tvOS, watchOS, macOS): Patches are being beta tested and will be available in a few weeks. Microsoft: A security fix has been released and will be installed through automatic updates. You Windows users have automatic updates enabled, right? Linux: The patch is available now. Google has updated some of the security features of their service. If you use Google for anything, take their security checkup now. Some are calling this a hack. Some are calling it a leak. This isn’t either of those. At over 30 million unique IDs, this is a massive data breach. It might be a good idea to familiarize yourself with haveibeenpwned.com, bokkie. And here’s the follow-up about the source of the breach. That’s all for this week. As always, if you have any questions or comments, don’t hesitate to write to us. Our cyber-security experts are here to help you stay safe, secure, and protected while online. Today we are very excited to announce the initial release of EasyVPNConnect for Windows. We created this application to greatly simplify the process of connecting to IronSocket’s global network of servers and services. EasyVPNConnect is free and available for all subscribers to use. Getting started with it is as easy as 1-2-3: download, install, and run. There is no third-party software to download and there is no need to import any additional server profiles. It’s an all-in-one, self-contained application for VPN, DNS proxy, and IP address whitelisting (authentication).